So tell me, what is your first reaction when you see a snake? Do you have a "natural aversion"? Or perhaps you understand this as a "conditioned response". Conditioned from what or by whom? Maybe you have just the opposite reaction -- perhaps you have grown up with an affinity for snakes.
" ... Early this morning, I received a surprised call from this very special man and I must admit that he had, brighten up my day despite the fact that in the midst of our conversation, I could feel goose-pimple "popping" out on the surface of my skin !! He actually rescued a poor little spirit, oops, I mean a flimsy,slimy greenish and yellowish looking snake across the path with a stick as it was struggling to do so. Most people at the sight of it will probably scream their hearts out or they will just run away and withdraw. Gee, I would never be a able to overcome the fear of all the crippy crawly insects, let alone lifting up a snake !! This guy is the real Hero of my life and it takes a lot of courage to do that- what a splendid act on SPONTANEITY !" " ... As for your story about the snake -- how interesting our conditioning, eh? One person hears this story and feels goosebumps; another imagines putting down the stick and picking up the snake with their bare hands. Educated (so he knows if the snake is poisoness) and experienced (so he knows how to handle snakes, and not exhibit fear), this is no problem at all." "Kind of like life. We need both wisdom and experience to walk along the path of life, and understand how to deal with snakes and other slithery creatures that cross our paths. ..."
Life certainly is interesting, isn't it. So hard to tell what are "natural" reactions, what are "conditioned" reactions, and what are "instinctual" reactions. It seems to me, any time we find ourselves "reacting", we might choose to analyze the underlying reality. And give ourselves the space between the event (e.g., seeing a snake) and our reaction (e.g., scream our hearts out), to determine what our response will be. "Between stimulus and response, there is a space. In that space lies our freedom and power to choose our response. In our response lies our growth and freedom"
The other day, I happened to look up at the sun. Yes, it had been a while since we last saw it ;-) And what did my eyes behold? Blindingly bright light, surrounded by a circular rainbow. For this picture, I let the peak of our garage block the sun. So you don't see the entire rainbow, but trust me, it goes all the way around. I've seen these kinds of rainbows before, but only from airplanes, looking down onto the tops of clouds. This was the first one I've ever seen from the ground. I did a little Google research, and every reference I found to circular rainbows said you need to see them from on high -- but this one is from the ground looking up. Perhaps a little more rare than I had imagined. Anyone else ever see one of these from the ground? Something about the ocean is both alluring and scary to me. It’s calm, rythmic, lullabye can quickly place one in a meditative trance. But its ferociousness during a storm or tsunami can also make you run for your life. And then there is its boundlessness, stretching on past the horizon, seemingly toward infinity. With depths greater in some places than our highest mountains, and pressures that would crush virtually all living things. The ocean has the power to take life, and to sustain life, with food and by providing us with oxygen — more plentiful than the Amazon rain forest, thanks to the vastness of its simple algae. In short, the ocean is a metaphor for the universe. And in such a universe, what is the meaning of any one of our simple lives. Surely it can be no more significant that the dropping of a single pebble into the boundless ocean, right? of the head nurse to talk in such circumstances. hall just next to her daughter's room?" world." The head nurse paused, then turned plaintively to Mrs.
that you would go out and tell him for me?" become lights to each other! 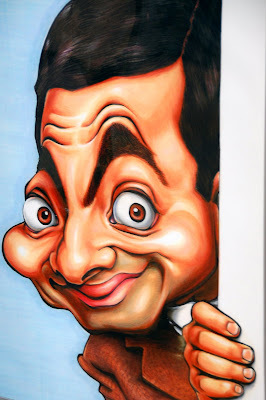 Caricatures are interesting, don't you think? And they can be quite fun and entertaining as well -- perhaps you've had one drawn of you or someone in your family. Of course, we understand what we are seeing here. The good ones are recognizable likenesses of the subject, but usually with many of their least flattering features exaggerated for comic effect. It can be a good laugh. Or it can sometimes hurt a bit, if the subject lacks self confidence. And so we have the Virginia Tech massacre, and the media frenzy. I mean, really, have you seen anything like it? No, no, I don't mean the tragedy. I mean the media. Some of you may know that I don't watch TV, don't listen to talk radio, and I don't read the newspaper or weekly news magazines. Ohmigosh, how will I ever know what is going on in the world? Well here is my secret. I subscribe to two free news summaries over the internet (CNN and NYTimes). I receive daily headlines and editorials. Based on the headlines, I decide if an article might be worth reading. Perhaps you can guess that I don't read very many of them. So yes, I did know about the shooting. But that is all I really needed to know. I could easily predict the media frenzy. In the comments section of a recent post regarding Attention, an anonymous commenter from the other side of the planet and I veered into this topic area. Feel free to check out that dialog if you like. It is where I realized that what we are seeing on the media is simply that: a caricature of American life, intentionally designed to exaggerate our least flattering features. [D]o not become trapped. This is NOT America, nor the world. This is a caricature drawn for a single purpose: to titilate, to stimulate, to profit. There is no accuracy to the picture. You know that in your heart. Your experiences tell you that as well. But the infernal drumbeat looking to steal your attention will continue. Just turn it off. That is your choice. OK, so you know my bias. But what on earth is my point? Just this: Life as told to you by another person is nothing but a concept. There is nothing real about it. You are distorting what you've been told with your own biases, just as that person distorted his perceptions when forming them into concepts and words. This may be intentional (like much of the media) or not (like a friend trying to make you understand their perspective). But either way, it is not reality. What you must do is find for yourself your own reality. You must directly experience life, and come to a deeply resonant internal "knowing". Some would call this a mystical experience. Again, this is but another concept, which surely means something different to you than it does to me. And when I look with mindful attention, when I am present and deeply aware of my surroundings, I can see the pain and the suffering in the world, and I can try to be fully present for it. But I can also see the compassion and the joy, and I can try to be present for that as well. And when I am mindful, I keep noticing beauty and safety and kindness and compassion all around me. So let's not report on what others see. Let us describe our own experiences. Let a thousand individual voices create the harmony that reduces the media drumbeat to mere background noise. Which your mind is designed to naturally filter out. Until it might as well no longer exist. When you see the caricature painted by the media, and the frenzy of talking heads feeding at the trough of sorrow, throw back your head and laugh. It is tragic comedy, not reality. The suffering for the families of the victims, and the family of the killer are real. We can be present for that. Respectful of that. And offer them our love and forgiveness. And one act we can take to help heal our worldly family in this time of sorrow, is to turn off the TV. Just turn it off. Be present for your own family. And begin your own journey of awakening to real life. Are you checking for your messages? They could be in your mailbox, in that e-mail you just received, perhaps on your voicemail? Or perhaps with the neighbor you visited, or the bum on the street corner, or maybe your grocery bagger? Here is a nice little video story about such messages, and the joy it obviously brings to both the giver and the receiver. Imagine such a win-win situation. Yes, it's a little different from the transaction-based mentality of our advertising messages. This is something deeper. Something more connected. From the soul, and for the soul. Or for wisdom. I remember my kids had a teacher in highschool (or earlier?) that used to start class with WOWs. Words of wisdom. I don't remember now if they discussed them, or if he just left them on the chalk board. But I can tell you that often we discussed them at home. I thought that was a great offering to the students. Anyway, check out the video and see what you think. It may be a little saccharine for some, but I think you can see the sincerity and the love despite that. And enjoy. So tell me ... do you have the time? Time to visit? Time to be aware of the world around you? Would you miss a beautiful sunset like this because of your pre-arranged plans? We've all heard the phrase "it's the journey, not the destination" but how many of us really understand what that means and live by it? How many of us get caught up in the busyness of planning to get to Point X, then traveling to Point X, and finally reminiscing about Point X? All the while missing what might have been in store for us at Point B or on the way to Point G, or while zipping right past Point Q? I came across this article from the Washington Post today. It's rather long, and knowing you are busy (and might not have the time ;-) I thought I would excerpt a couple of quotes from it. This is a story. Actually, a well told story of an experiement. Of a world-class violinist positioned as a run-of-the-mill street performer at a busy D.C. metro station. Do you stop and listen? ... What if he's really good? Do you have time for beauty? Shouldn't you? I wish not to spoil the results of the experiment. You might want to read the article. Over tea, perhaps. When you have a moment. Or two. The violin is an instrument that is said to be much like the human voice, and in this musician's masterly hands, it sobbed and laughed and sang -- ecstatic, sorrowful, importuning, adoring, flirtatious, castigating, playful, romancing, merry, triumphal, sumptuous. ... So, what do you think happened? This might cause you to reflect philosophically: What is beauty? Is it a measurable fact (Gottfried Leibniz), or merely an opinion (David Hume), or is it a little of each, colored by the immediate state of mind of the observer (Immanuel Kant)? How might you have felt, lucky enough to be one of the passer's by during this experiment? Would you really notice? Would it make a difference? The violinist's bow begins to dance; the music becomes upbeat, playful, theatrical, big. ... "Whatever it was," he says, "it made me feel at peace." Are you sure? Perhaps you have another focus. A hundred feet away, across the arcade, was the lottery line, sometimes five or six people long. They had a much better view ... if they had just turned around. But no one did. Not in the entire 43 minutes. They just shuffled forward toward that machine spitting out numbers. Eyes on the prize. What kind of tunnel vision do we create for ourselves? Let us not blame it on the work, or the lists, or the destination. "Couple of years ago, a homeless guy died right there. He just lay down there and died. The police came, an ambulance came, and no one even stopped to see or slowed down to look. People walk up the escalator, they look straight ahead. Mind your own business, eyes forward. Everyone is stressed. Do you know what I mean?" In closing, I'd ask you to reflect on the experiement, and the story. What is it trying to tell you? How do you interpret it? If we can't take the time out of our lives to stay a moment and listen to one of the best musicians on Earth play some of the best music ever written; if the surge of modern life so overpowers us that we are deaf and blind to something like that -- then what else are we missing? What else indeed. How can we possibly know? But there is good news here. Really good news. You control the end of this story -- how you choose to treat each passing moment, each glimmer of beauty, each breath-taking sunset. Why not pull up a chair, lean against a wall, turn off the iPod, put down the paper, and have a look and a listen. I promise you -- you won't be dissapointed -- and you do have the time. Can you hear the gentle rippling of the shallows? You can see by the convergence of diminutive waves and crests? This is the where the current reflects off objects in the stream, and creates the dance of light and sound. And there, just below the surface, a fallen leaf waits patiently, taking a little respite from its journey down stream. Soon enough, the water will shift again, and an upward current will likely bring it back to the surface. Soon enough — but until then - it is art. We call it art, nay, together, we make it art. And what of it? Well, listen closely. Can you hear the notes ... the melody? I can. So soothing, so moving. As you lean back and soak up the afternoon sun, smell the pine bows, feel the damp soil with your hands, and smile. Something connects. Nothing else to do. Nowhere else to be. This is where you belong, right here, right now. It’s waiting for you, just below the surface of our work-a-day world. There, just below the surface, where you are protected from the current that is trying to sweep you along, to jostle for your attention, to whisk your day away, in the never ending lists, and the stuff that must be done. I remember the morning well when I visited with this little fellow. I was out soaking up the early morning sunrise, as the overnight frost was beginning to thaw. And of course I had my camera ;-) Frito was off visiting the neighbors, when I noticed this little bird on the ground, just underneath a cedar tree. “What are you doing down there?”, I thought, as I snapped a couple of pictures. And as one with a camera is wont to do, I kept inching my way closer, waiting for him to fly to the safety of an upper branch. But he did not move. “He must be injured,” I thought. I lay down on the ground (bathrobe and all ;-) and looked closely at him, but could not see any injuries. So I snapped a few more pictures — this is one of them. I love how you can see the detail of the feathers, fluffed up on his chest, to give him some insulation from the December chill. “What should I do? Get a shoe box and take him inside?”, I wondered. As I headed toward the house, after visiting with him for 5 or 10 minutes, he just flew away. Clearly not injured. Why he was warming himself on the ground, and why he was so trusting, I do not know. But I was happy for the visit. This past weekend, my wife and I repaired a bunch of broken bird feeders we had kept in the garage, and now have them swinging to and fro in our front and back yards. We must have over a dozen now. And the offspring of this little slate-colored junco are flittering all over, enjoying plenty of food, joined by the occasional cardinal, woodpecker, goldfinch, and chickadee. A bird at my feeder clearly had a message for me. What was it? I had seen him before. In fact, I believe now that, after seeing him nearly every time I go into the backyard, that there is a purpose in our meeting so often. I speak to you of signs, verbal nudging, brilliant, glowing, attention- grabbing moments, that make me aware that God is trying to say something to me. But there are also subtle, seemingly insignificant occurrences that may in fact, bring even more important issues to light. He sent me a feather. "Oh, Bob, there are feathers all over the yard around bird feeders," you might reply. That's true. So what is so significant about this one? The tiny bird handed it to me. "Okay, too much medication, Bob!" It is most likely the fact that because I am back to my old self, I have once again found life in the smallest of things. Most of which goes unnoticed. A chickadee. A black-capped chickadee. Not any bird. But the same one over and over. How can that be? How could I possibly know one from another? This one has one good leg. The other is crippled and held close to the body. The very first time I noticed it, I was amazed by the perfect balance and ease this bird expressed in doing what every other chickadee does. I have made it a point to stand just a few feet away from the feeders so I can see them close up. The only birds that appear unaffected by my presence are the chickadees and an occasional sparrow. My one legged friend always stops by. We talk. Yes, it's true. I make a high-pitched "beep, beep beep," sound and he responds. My friend even dances from pole to pole on the feeder, finally grabbing a sunflower seed and vanishing to the nearby holly bushes and back again. "How do you do it?" I asked. "You are limited and not the same as all the others." He teases me and jumps back and forth to show off his power to adapt. Every single time I walk out there, he appears. Every single time I stand there, amazed by his ability to be what he was created to be no matter what limits were placed on his life. "I see you and want to be that brave," I said. The thought then came to me that perhaps he looks at me and thinks I'm limited because I cannot fly. "Oh, my friend. I would give anything to fly!" I said, and walked back into the house. Later in the early evening, as a part of my regular routine, I went back to the feeders, filled them, added water to the bird bath, and waited. As always my feathered friend appeared. "Beep, beep, beep beep!" I said. He quickly darted back and forth showing off a bit. For the first time he came close enough that I could almost touch him. The right leg was indeed damaged beyond use. "Fly for me, please, and take my spirit with you so I can soar in my dreams tonight." This will be hard for anyone to believe, but trust me I thought it to be amazing, too. He tucked his head under his right wing and plucked a feather. Looking at me as he nervously cocked his head back and forth, he released the tiny feather from his mouth. What seemed to me like a dreamy slow-motion moment, I watched the feather falling and reached my hand to catch it. Looking down into the palm of my hand, I thought I saw the tiny feather appear to glow in contrast. I looked back up at my "frequent flyer friend," and said "Thank you!" Now, as silly as this may seem to you, I see it as a precious gift from God. For I had asked my friend to take my spirit soaring and he in turn gave me a feather so I could fly. "It won't get me off the ground!" I said, laughing. "But it is a beginning. A little piece of a dream to prove there are no limits to the abilities you have been given," the Voice said to me. The only limits that exist are the ones you choose to accept.